I am Sudarshan Chaudhary a Napali national with indigenous family profile graduated from Tribhuvan University in management in 2014. I have been working in different NGOs in the issues of indigenous rights, women rights, youth rights and sustainable development. I am interested on indigenous rights, women rights, ethnicity, inclusion, climate change adaptation, bio-dynamic farming, land rights and sustainable development. I have been working in the field of indigenous rights, women rights through different NGOs. At the same time I have involved in doing bio-dynamic agriculture practice for sustainable farming in a community level to promote indigenous food system. First I served as chair person of Community Service Forum Nepal for 6 years. During the time I served in a planning and implementation of the program related to indigenous issues and rights in the local community. 2nd I worked 6 years at District branch executive member of NGO Federation of Nepal. During the period I organized and facilitate various training at district member NGOs and we involving to making strategic plan of local NGOs and worked for strengthening the capacity of NGOs. 3rd I worked at Lok Kalyan Nepal a NGO as a program coordinator. Program funded by Poverty Alleviation Fund. As a program coordinator I manage overall program head. Coordinate with staffs for social mobilization, formation local groups and preparation sub proposal for groups on their self demand base, coordination and linkage them with local government, agencies and stakeholders. Capacity enhances local community for their sustainability and institutional development. Write success story of local communities. 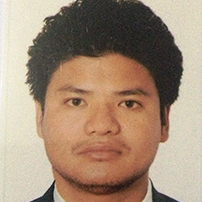 4th I worked 3 years at Youth Federation of Indigenous Nationalities (YFIN), Nepal as a Secretary General. As a secretary General of YFIN Nepal.As a secretary general, I organize timely meeting with co-ordination of president, present activities and reports of YFIN Nepal and circulate to district branches and member organization. Now YFIN Nepal working with IPs youth organizations and we have 45 caste based youth member organizations and 55 district branches. YFIN Nepal mostly works on the issues of IPs youth issues, inclusion, indigenous rights, land rights, climate change and adaptation, Sustainable development and also lobby and advocacy with Govt. of Nepal for IPs youth friendly National youth policy and strategy. We are strengthening member organizations and district branches through training and capacity building programs. Currently engaging and starting my own Bio-dynamic (Organic) farm in rural area, which is established in 2013. Where I’m practicing Bio-dynamic (Organic) farming for sustainable farming and conservation of soil and micro organism. In my farm we are teaching young youths for bio-dynamic farming, why it is necessary, why we need to do bio-dynamic farming for sustainability. In our farm we are focusing on making good Biodynamic compost which helps to protect our land and creating ecological balance through farming. Through Biodynamic farming gives us good food, good health, air, water, soil and social wellbeing. It helps us conserve our climate through farming. With farm also I’m engage with local indigenous youths and women. We are just started “Moringa farming” and “Organic chicken farming” project with local indigenous youths and women in 3 hectors land area. Every year we organized and trained more than 100 women, youths and IPs peoples about Spiritual and organic farming. In 2017 our farm win prize from call “100 Projects for climate initiatives” called by French Sea and Environment ministry and we got 3,000 Euro.